There are many paths for sales professionals. Some transition from sales development to quota-carrying inside sales, many move from a hybrid sales role to that of a field rep and others gravitate to leading a sales team of their own. I’ve been excited to make this last transition recently here at LevelEleven, becoming our new Director of Sales Development. I’ve been a quota-carrying sales professional for the past 8 years and have loved every bit of it – truly. I was also the second employee at LevelEleven, so I’ve been able to closely watch its growth and have a hand in shaping its culture. Building, leading and inspiring a well-oiled sales machine has been a goal of mine for many years, and I’m grateful for the opportunity I now have to do it. The process, expertise and effort it takes to make this transition have already been eye-opening. One of the better initial decisions I’ve made thus far was to take a step back and complete several discovery meetings throughout our existing organization. This has been a tremendous exercise, allowing me to understand strengths in our current process and areas where we can go to the next level. 1. 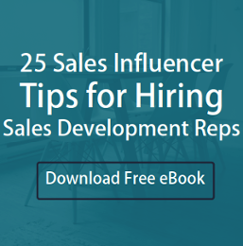 Give your sales development reps a playbook. Teeing up your sales development team for success is the main goal of any good leader. Even your brightest new hire is going to perform better with a firm understanding of their role and responsibilities, your expectations of them, and the criteria on which they’ll be measured. You also want to include content on how you go to market, who your ideal buyers are and what your messaging is. Take the time to make sure this is put together in a digestible way that’ll keep everyone on the same page. 2. Define the right sales KPIs. 3. Get your new hires ramped up FAST. There’s a lot of risk in bringing on someone new. The key to keeping a healthy pipeline is to knock down the red flags quickly and then work to get a return on your hires even more quickly. Make it clear that you need their buy-in because you’re invested in their development, too. Not only is this good for you as a manager, but the faster a new employee feels like they’re contributing, the sooner and stronger they can begin to connect with your company and its mission. 4. Keep momentum and energy high. 5. Show people the light at the end of their career path. For me, building and leading my own team was something I always worked toward. This might not be everyone’s goal, but you want to understand what your team’s ambitions are so that you can give them a roadmap for what they need to do to get there and do what’s in your power to enable them. This provides assurance that you care about their development and a reminder of what they’re working for when things get tough. It’s easy to get flustered in a new and larger role, but I believe leading with a purpose and continuing to be the same person you were before that role will bring success. Good luck on your new path! New to being a sales development leader? Make the most of your role early on with these five tips.